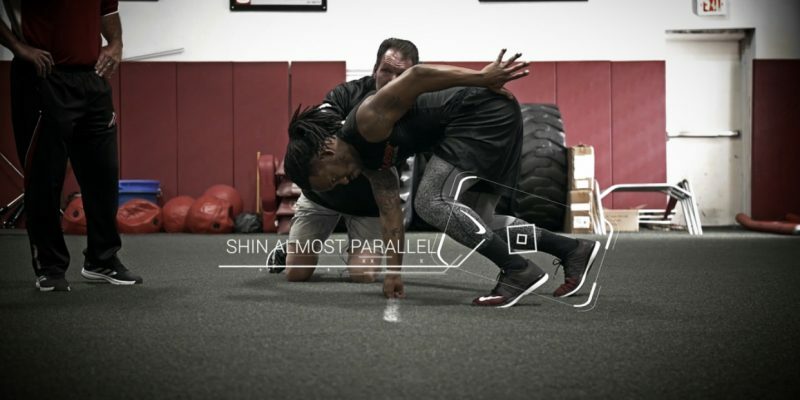 These combine training tips come straight to you from Parisi Speed School founder, Bill Parisi, and NFL Combine Director and owner of Parisi Speed School Fair Lawn, Rich Sadiv. Parisi Training Systems has produced more top combine ranking athletes than any other organization. Our 25 years of experience and training has produced over 135 NFL Draft Picks, of which 20 athletes ran in the 4.3 or better. Included in the ranks are #2 overall pick Chris Long, Greg Olsen, Josh Norman and Alfred Morris. Follow these expert combine training tips and you too can perform like a pro. 1. The 40-Yard Dash is the most important combine test. The 40-Yard Dash can make or break an athlete. It’s seen as a qualifier. If you don’t run a good 40-Yard Dash, you won’t be able to qualify for the other combine events. It’s crucial to begin in an aggressive stance. Your first step is the most important element of mastering the 40-Yard Dash. To maximize the first step, there has to be a violent exchange of the back leg with the down hand. Think of a pole vault. You want to launch off your down hand in the same manner. At top speed, focus on arm action. Think of your arms as hammers and repeatedly hammer back, still keeping the core tight and body stiff to avoid energy leaks. 2. The shape of the 5-10-5 is the rooftop of an A-frame house. The 5-10-5 is a measure of your change of direction and goes by a couple different names – Pro-Agility, Short Shuttle, and the 20-Yard Shuttle. Many athletes do not perform this race efficiently, but simple techniques can improve that. The most crucial element of combine training for running the 5-10-5 efficiently is the path your run. The shape of the 5-10-5 is the rooftop of an A-frame house. The start of the race is the very top of the roof. Your touchpoints are the bottom of the roof. Anything run outside of this shape equals a loss of time. 3. Ritual is very important in the Standing Broad Jump. This is a true test of power. While your stance is important, mental preparation plays a huge role in this test. Your best jumps will be jumps three and four because you’ve primed your nervous system. Make sure you get one or two practices in before you attempt. You need to perform the jump the same every single time. Hands come up, on your toes, hands come back (like an olympic diver). Perform again and on the second olympic diver, rapid fire with your arms and leap straight out (think Superman!) Use your arms as anchors to project yourself forward. 4. In the Vertical Jump, touch the rim – don’t swat the fly. Everyone can improve the vertical jump with a couple simple strategies. Getting extra height through elongating your body all plays a role in adding marginal gains. Be sure you do not line up too close to the post. Think about jumping up to touch the rim – NOT trying to swat a fly. Pick a spot and pretend that’s the front of the rim. Visualize yourself jumping to that spot. Maybe even ask the evaluator to show you were 30 inches is. 5. The Bench Press is not ONLY about form. Setting up for an effective bench press is important, but keep in mind, this is not the prettiest of tests. It’s all about getting as many reps as possible. We’re not looking for perfect form; we’re looking to move the bar as fast as possible. The key is pulling the bar down right as it gets to the top. The focus is on turning the force around at the top of the movement as fast as possible. You will fatigue quickly. This technique allows you to maximize reps. The L-Drill (also called the 3 Cone) is like a dance step, and also the test where the most mistakes are made. The L-Drill is sometimes a wild card, and may not be tested, but if the L-Drill is not part of your combine training and they test it, there will be mistakes everywhere! Remember to stay tight to the cone to avoid extra steps. You do this by remembering there are different gears to each phase. The first 10, you are going 80-85% and then you begin to pick up speed, getting to 100% as you round the cone on your way toward home. 7. Program for both speed and strength. During your combine training, it’s crucial to be following a training program that focuses on both speed and strength gains. 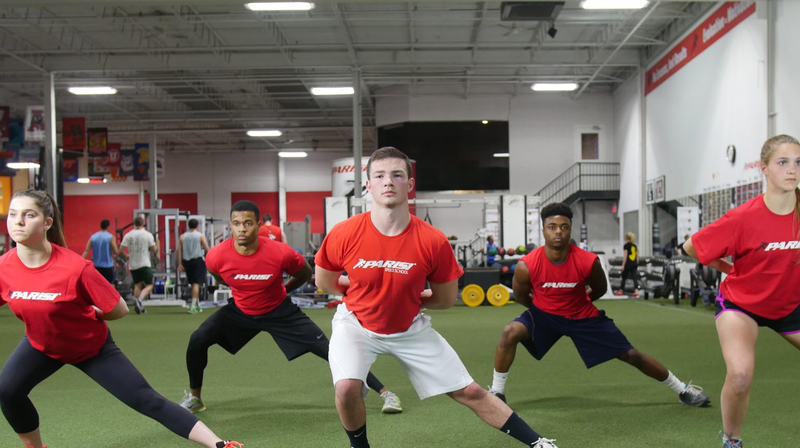 These days, a lot of fitness professionals will lean heavily one way or the other, but at Parisi Speed School, we know the importance of balancing speed training and strength training for a well-rounded, powerful athlete. In our world, speed training IS strength training. It’s all about being strong enough. Strength is relative to body weight. A well-rounded, powerful athlete is strong enough in relation to their size while still maintaining optimal speed and agility. 8. Remember the 4 R’s of proper athlete nutrition. Refuel. Extremely important to help your body recover, reduce soreness and inflammation after a workout. Right after a workout you want carbs and protein in a 2-to-1 ratio within a 30 minute window. Rehydrate.In terms of how much water you should be drinking, it definitely depends on how active you are throughout the day, but we recommend 0.5 to 1 ounce of water per pound of bodyweight per day. Repair. When we think of repairing our muscles, we think of protein. When you workout, you are tearing down muscle fibers. Right after a workout, you want to prioritize protein (and carbs) to help build that muscle back up. Rest. When you’re breaking down your body, you need rest to help your body get back to where it was. If you’re not sleeping at night, your body is not going to fully recover. 8-10 hours of sleep a night is just as important, or even more important than your training. 9. Mental preparation is just as important as physical preparation. Commit. You have to completely buy into the process. Trust the process. Have confidence in your hours and weeks and months and years of hard work all leading up to this moment. Visualize. We tell our athletes to create a victory reel in their mind. Visualize yourself taking each of the evaluations and doing it to the best of your ability. Play that victory reel over and over again with the same result – success. Set goals. Set specific goals for yourself. If you don’t know what your goal is, how are you going to reach the goal? “Doing well on the football combine tests” is not a good enough goal. What does “well” mean to you? What time do you want to set on the 40-Yard Dash? How much do you want to improve your vertical jump in the weeks leading up to the event? Setting specific goals is crucial to your success. 10. Team up with a certified professional. It’s our goal to give you the best advice for your combine training to help you maximize your performance. We’ve given you the best tools for your toolbox. Now it’s time to get to work! Team up with a local Certified Parisi Performance Coach or take the 5-Star Combine Training Course to deepen your knowledge and further enhance your skills.